As the need for healthy reefs increases, Hawai'i finds the condition of its marine ecosystems in decline. Coral cover has decreased at many locations, especially near the island of Maui. On the coral reefs of Maui, coral diseases have become more prevalent, and nearshore fisheries have declined by more than 75% over the past century. These trends predate the state's first truly statewide mass bleaching event in 2015 that affected almost all of the Hawaiian Islands. While it is too early to know the long-term effects of these events, Hawai'i is taking action to address this new threat and reverse the declining condition of coral reefs. At the 2016 World Conservation Congress, Hawai'i's Governor David Ige announced an ambitious plan to effectively manage 30% of Hawai'i's nearshore waters by 2030. To meet this goal, Hawai'i's Division of Aquatic Resources (DAR) has initiated a process to develop a statewide network of marine managed areas, and has indicated that reefs along the west coast of Hawai'i Island (West Hawai'i) and the leeward shore of Maui are priority locations in which to start the design and implementation of this network. To ensure long-term ecosystem sustainability and resilience, the network's design must consider climate change effects. The project team assessed the relative resilience of reef sites at two depths along areas of West and South-West Maui ("leeward Maui") in March of 2018. The surveys were conducted as a collaborative effort with DAR, The Nature Conservancy, and community organizations. This report presents findings from meeting these project objectives: 1) assess benthic cover comparisons among sites and depths, 2) complete resilience assessment including relative resilience and rankings for two depths, 3) conduct analyses that determine the primary drivers of differences in resilience between sites, and 4) develop a framework for using the resilience analysis outputs to identify and prioritize potential management actions to support the resilience of coral reefs in Maui. Citation: Maynard J, Conklin E, Minton D, Williams GJ, Tracey D, Amimoto R, Carr R, Fielding E, Lynch H, Rose J, Sparks R, Sylva R, White D. (2019). 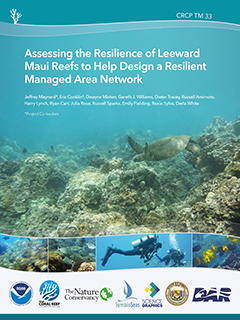 Assessing the Resilience of Leeward Maui Reefs to Help Design a Resilient Managed Area Network. NOAA Coral Reef Conservation Program. NOAA Technical Memorandum CRCP 33, 40 pp.